dahl is proud to offer superior customer service. 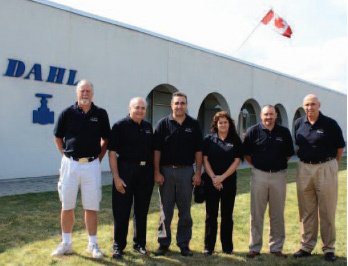 Quality design and engineering are the foundations for the superior products you will find at dahl. We receive many new product ideas from listening to customers and the feedback they provide. What are their problems? What specific needs do they have? Our engineering expertise and manufacturing flexibility allow us to respond quickly to customer requests which is clearly apparent in our Build your Own Valve on-line tool. Sales, Engineering, Manufacturing and Quality Assurance departments meet weekly as a group, resulting in an outstanding spirit of cooperation and a fast product development cycle, from the initial idea through the product shipment to customers. We invite our customers to share their thoughts through order checks, technical requests and / or general inquiries. Send an e-mail to sales@dahlvalve.com for technical information or quote requests on any dahl products.